I initially launched this site – with the able assistance of (first) my daughter-in-law and (now) my son webmaster – for two reasons. 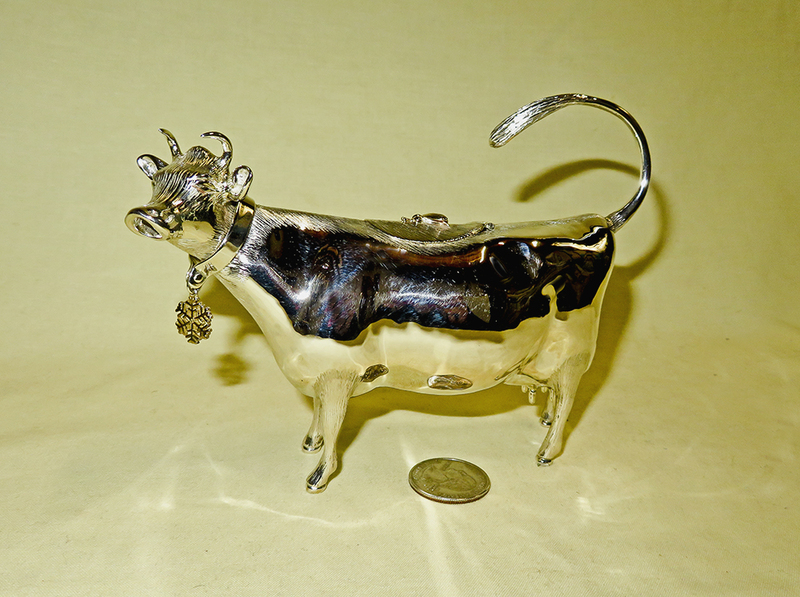 The first was to share my fascination with the numberless ways in which such a straightforward thing as a cow can be represented in the form of a creamer. The second was to invite others to help me pinpoint more specifically the origin and provenance of the many creamers that I own but haven’t been able to trace. Most come with little or no information and even generic terms like “Staffordshire” or “Delft” can be misleading; and in spite of several web sites that help with hallmarks and makers marks, there are many that are unmarked or with marks that I haven’t been able to locate. Over time however I’ve found a third reason to maintain and upgrade the site: my web searches to trace the creamers have given me many fascinating hours of fun learning about history, geography, pottery in general, and even evolution. I’ve tried to share some of the interesting things that I’ve learned in these web pages…starting with a bit about when, where, and maybe even why people started making these things, in the section on “History”. I’ve also found that I’m not alone – there are indeed other cow creamer collectors, and even more folks who have inherited one or more from a relative and want to learn a bit about it. I’m always delighted to converse with other collectors, and more than happy to try to help folks identify what they have. This works best of course if you send me a picture, but again the caveat is that I myself have little idea about the maker, or even the age, of many in my own collection. One touchy subject is value. About all I am either able or willing to do is tell roughly what I have paid for an item, and when and where I got it, which is often eBay. Even this can be way off the mark, since eBay itself has had such a significant impact on price, and also because some eBay sellers have really weird ideas about what their items might be worth; I’ve gotten some bargains, but probably have overpaid just as often. When I had to scour the antique shops for cow creamers it was hard to impossible to figure out what was rare and what was common. It’s a lot easier now, and in many cases what I was originally excited to find, turns out to be pretty routine. The Jackfield creamers are a good example of this. When I lived in the UK (1995 and 1996) I’d very rarely see one, but now there are almost always 10-20 or more on offer on eBay. So if you do want to ask me for advice, please be patient because I don’t always have ready access to email, and don’t expect anything more than very rough estimates about how much something may be worth. Indeed, your best bet is to start by looking for similar items on eBay. Staffordshire, or more properly 18th and 19th century British cow creamers (with a couple newer ones), plus separate sub-sections on Welsh Ceramics from the potteries in Swansea, and Spill Vases which were made to hold paper tapers or wood slivers used for transferring fire but which also were designed to serve as creamers. Modern Variations: This is the biggest category, with an eclectic assortment of interpretations, many of which are unmarked. If there’s also a teapot or pitcher that matches, I’ve put them in those categories. Creamers and Sugars: More ‘modern variations’, but enough of them that they’re best kept separate. Christmas: Santa cow, etc. Enough of them, especially teapots and pitchers, to single them out. Pitchers: Just too darn big for cream…but designed to pour, most likely milk or water, but in some cases wine. Most follow the two-hole rule, but there are a few that were too neat to resist that don’t. Suiteki or Water Droppers: This is a later addition to the collection, of interest to me because they meet the ‘two hole’ rule, and because I wanted some traditional versions of a cow, bull or ox from the lactose intolerant populations of the Far East. Teapots: They fit the rule! And, they’re fun. I have over 200 of these, which is a good sized collection in and of itself. Many of them also have creamers and sugars as a set. Rhytons and other Liquid dispensers: This somewhat eclectic category includes modern reproductions of ancient rhytons (see the History page), as well as some cow and bull shaped cruets and vessels designed for wine, oil and vinegar, liquor, that didn't fit well elsewhere. It also contains a separate area for Nandi because like Rhytons they are used for ritualistic purposes. Nandi (Shiva’s Bull) – Hindu holy water pot. These are included with Rhytons because of their religious use. This section also includes a number of holy cow and bull vessels used for other purposes in Hindu temples. Tea Sets: Some of these include real cow creamers; but I’ve also included a number of the resin ‘collectibles’. Watering cans: What can I say? They do have two (more than two actually) holes.